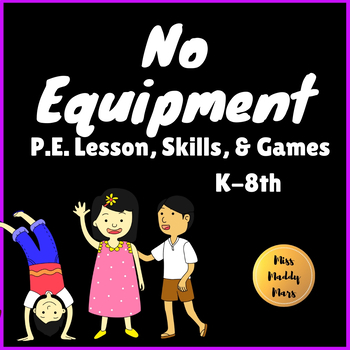 This includes 12 PE games that require zero equipment! All you need is an open space and a class of students and they will be moving and having fun! This resources has a teacher instruction sheet and three pages of games split between different grades. Most games can be played over a wide variety of grades with different variations for less/extra challenge. Special Thanks to Creative Clips for the cute swirly border! Copyright © MissMaddyMars. All rights reserved by author. This product is to be used by the original downloader only. Copying for more than one teacher, classroom, department, school, or school system is prohibited. This product may not be distributed or displayed digitally for public view. Failure to comply is a copyright infringement and a violation of the Digital Millennium Copyright Act (DMCA). Intended for classroom and personal use ONLY.